I love chatting about the health benefits of hot yoga. It is the key ingredient to anyone who wants to achieve overall success. Taking up yoga is definitely a smart goal for success. Feeling stressed out or having too many thoughts and ideas running through your head? One of the health benefits of hot yoga is that it connects the mind, body and soul which aids with focus and concentration. Anyone who is high achiever knows how important this is. Taking time out to attend a class is a great stress reliever and a great way to become more focused. When is it the best time to go to a yoga class? I find whenever I’m stressed out or gotten into an argument with a family member or friend. Is is a great way to completely disconnect from the real world. All you do while spending 75 minutes on your yoga mat is completely clear your mind and focus on your breath or at least that’s what you’re suppose to do. I have a difficult time “quieting the mind” so I use that time to be mentally still which allows for self-reflection. Whatever is bothering me at that moment I try to work it out in my head. Usually by the end of the class the things that worried me don’t bother me and more and what’s important in life is put into perspective. I have been practicing yoga since January 2009 when I moved to Burlington from Oakville and I continue to practice it now that I live in Montreal. I decided to continue to practice because I knew of its many health benefits of hot yoga. Over the years I have the opportunity to practice at several studios such as Some Like It Hot, Hot Yoga Wellness, Moksha, Chrysalis and The Burlington Yoga Centre. The yoga membership scam. Why some studios take advantage of their clients and how you can protect yourself. One of the great things about most yoga studios is that they offer good promotions for beginners. It may be a free class or a small fee for unlimited yoga for a week. If they don’t, ask. Monthly memberships can be over $100 so they should let you try out at least one class before you commit. Warning though: make sure you go there with an open mind because my first yoga class there was the most difficult thing I have ever done. You might find it just as challenging if you’re use to doing cardio or not exercising at all. Despite how difficult my first class was, I immediately signed up for a six month membership because I knew of the health benefits of hot yoga. I’m glad I stuck to it because unlike any other diet or exercise I have tried, yoga has completely transformed my body and my mind. My body is leaner and stronger and I find I can handle stress better. I’m more focused than ever when I practice yoga on a regular basis. Can you use yoga for weight loss? 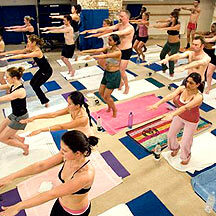 Click here for more health benefits of hot yoga. Why practice hot yoga over regular yoga? I love heat so that’s why I was attracted to it. Nothing beats a hot yoga class in the winter. Since in Canada we face more cool days than not. When you lie on your yoga mat with your eyes closed you can almost mistaken yourself for being at the beach. Technically though health benefits to hot yoga done in this kind of heat gives you a deeper stretch because your muscles are warmed up. In turn you are less likely to injury yourself. How do to find the best hot yoga studio in your area. Since room temperature can be over 105 degrees Fahrenheit (or 40 degrees Celsius) and the humidity at 40%, I realize hot yoga isn’t for everyone. There are many different types of yoga out there such as power vinyasa and yin. Click here for some hot yoga tips. I have tried yoga several times before I discovered hot yoga. Previously I wasn't really crazy about it. So if you have tried it and didn’t like it, give it another shot. Each yoga class can be different depending on the teacher. There’s a yoga class out there for everyone.